When the days get warmer, Mainers flock to shops across the state to get their gardens and lawns ready to bloom. Garden shops in Maine carry flowers, vegetables, trees, and all the supplies one needs to turn their gardens into a picture-perfect work of art. Here are the 10 best garden centers and nurseries in the state! O’Donal’s Nursery in Gorham has been serving Southern Maine for years with all their garden needs. O’Donal’s is more than a garden center. It is an educational center with knowledgeable staff who can help you pick the best plant for your gardens. Most of the plants and trees sold at the nursery are grown right there on the property so you know you’re getting the best. With three locations in Brunswick, Falmouth, and Cumberland, Skillins Greenhouse is a true Maine tradition. Started in 1885, Skillins is one of the oldest greenhouses in New England. You’ll find everything from seeds to garden tools to flowers and trees at Skillins. Throughout the year, they also offer free classes to help you become a better gardener. With a year-round flagship store in Yarmouth and a seasonal shop in Kennebunk, Estabrook’s provides colorful flowers and garden supplies to thousands of Mainers every Spring. Sign up for the newsletter or listen to their podcast to learn tons of helpful hints and tips from the gardening experts. Pinkham’s Plantation is more than just a local small town nursery. With over 40 years of experience in gardening and horticulture, there is no question that these experts can’t answer about your lawn and garden needs. Every May, Pinkham’s gives out 500 pumpkin seedlings to encourage the locals to grow the biggest pumpkin on the Midcoast. Coastal Landscaping and Garden Center is a family-owned and operated full-service garden center in York. The garden shop offers everything from pest controls to seeds to outdoor plants. Every year they grow more than 15,000 perennials on-site ready for your garden. Allen, Sterling & Lothrop is Maine’s oldest seed company with over 100 years of gardening experience. Located along Route 1 in Falmouth, Allen, Sterling & Lothrop is a four-season garden center, seed house, and nursery. If you’re looking for seeds, then Allen, Sterling & Lothrop is the only place to go. With five locations form Brewer to Portland, Urban Garden Center is the source for all your indoor and outdoor garden needs in Maine. 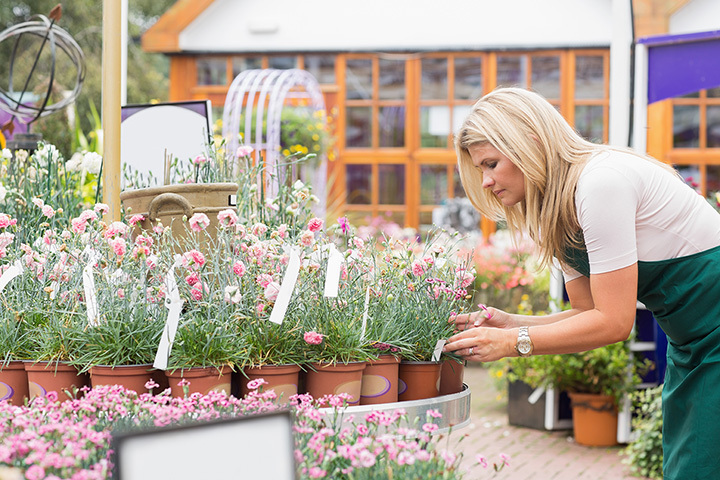 Each store stocks only the best products from the leading gardening companies so you know you’re buying quality. They specialize in hydroponics, organic soils, nutrients and pest control. Known for their beautiful flower arrangements for every occasion, Noyes Flower and Plant Shoppe in Caribou also has a greenhouse. The greenhouse offers a variety of flowers and plants ready to be placed in your garden. Every year they grow a wide selection of annuals, perennials, herbs, and vegetables. All plants are grown from Maine seeds. With two locations in South Portland and Westbrook, Broadway Gardens has been helping gardeners grow beautiful flower and vegetable gardens since 1950. Broadway is home to Northern New England’s largest selection of perennials and hard to find annuals to give your garden a burst of color this Spring. Gammon’s Landscape Nursery is a full-service plant nursery and garden center serving the local Lewiston and Auburn community. With professional and knowledgeable staff and an extensive selection of plants and gardening supplies, you’ll find everything you need here. If you’re looking for a little help in the garden this year, Gammon’s also offers professional landscape design, construction, and maintenance.